A sculptor in Yakutia creates dung art for his town and a woman in Chelyabinsk dresses her car in holiday velvet. The upcoming year, 2014, is the Year of the Horse, according to the Chinese calendar. 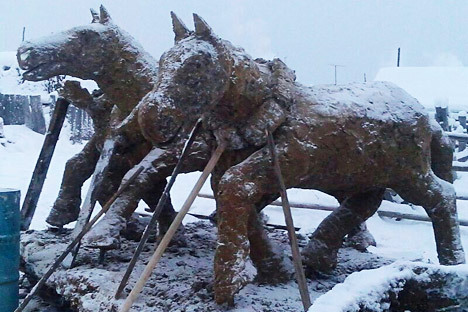 Mikhail Bopposov, who lives in the coldest Russian province of Yakutia, has decided to celebrate the occasion by creating a sculpture of two horses - made of dung. This is the third year running that Bopposov, an amateur sculptor, has created something special for his town. Bopposov kept his latest creation in strict secret from his neighbors until a few days ago. Last week the artist’s wife told the local media that everyone would just have to wait and see what (or whom) he would make out of dung this year, the Novyy Region 2 news agency reported. Judging from the reaction by some of the artist’s neighbors, the entire province has been waiting for his next work of art with bated breath. “Esteemed Mr. Bopposov of the village of Uolba, Tattin District! The people of Yakutia all want to see another dung sculpture! It's that time of year again!" one of the villagers is quoted as saying to SakhaPress.ru. Last year Bopposov welcomed the New Year by creating a dung dragon. The year before, it was a 7-foot long cobra made of the same fine material. Commentators have remarked that the two horses displayed to the discerning public this year look very friendly. They are modeled on a distinct breed that lives only in Yakutia. Not quite as tall as European horses, they have very thick fur, so they can stay reasonably comfortable even when temperatures plunge to -50 Celsius. New Year’s is not the only occasion when Bopposov unveils his new work. He has been known to open similar exhibitions on Women’s Day on March 8. Natalya Evlampiyeva of Chelyabinsk has come up with an ingenious way of welcoming the New Year: She dresses up her car in brightly colored velvet attire. “I once decided to surprise my daughter on New Year’s Eve by turning our car into a beautiful carriage,” Evlampiyeva told the Argumenty i Faktynewspaper. "At the time, she was only 10. So, in strict secret from here, I made a huge cat costume - it was the Year of the Cat, you see. I dressed our car in that costume, and drove right to the front door. My daughter could not believe her eyes, she was so very happy!" Since then, Evlampiyeva has fashioned a new costume for her car every year. "The following year it was an elephant, and the year after a dragon," she said. To celebrate the arrival of 2014, she has dressed up her car as the Blue Horse. The neighbors know to expect an unusual treat this time of year, and queue up to take a photo with the dressed-up car. The Russian statistics agency Rosstat has released the results of a study into the most popular New Year presents. It appears that above all else, Russians want each other to look good, and not to get bored. They therefore give each other games and cosmetic products, Rosstat chief Aleksandr Surinov told the RIA-Novosti news agency. Games and children’s toys are the most popular New Year’s gift, given by 22 percent of those surveyed. They are followed by cosmetics, beauty creams and shampoos (14 percent); towels, tablecloths and napkins (8 percent); and perfumes (7 percent). The average prices of the most popular New Year’s gifts have risen by 4 percent between November and December 2013; inflation is currently running at 5.9 percent. Based on materials from NewsRu.com and SakhaPress.ru.